Save 44 percent on the RRP. Update: The price has gone back up to £165. A thing isn't beautiful because it lasts. Original story: Black Friday is a reliably great time to pick up an SSD. We always tend to see steep discounts, from the smaller 256GB drives to the more PC player-friendly 500GB and 1TB SSDs. 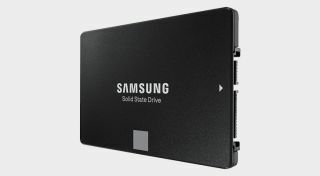 Today on Amazon UK, the price of the 1TB Samsung 860 Evo SATA SSD has dropped to £140, which is slightly cheaper than it cost on Black Friday. The 500GB model is also discounted. The 860 Evo is third on our list of the best SSDs. Samsung's Pro SSDs are the king of the bunch, but they'll set you back a lot more, so this is a great option for most players. We praised the Evo for its reliability and speed. If you haven't bought an SSD for your PC yet, this is your chance to see what a difference it makes to your experience with Windows and loading times in games. Amazon doesn't say how long the 860 Evo will remain at this price, so act fast while it is. We're stripping out old deals and adding new ones all the time in our Black Friday deals hub, so check it out.